MAJOR PRICE REDUCTION This Sport Cruiser remains an impressive blend of sophisticated style with luxurious accommodations, quality construction and excellent sea keeping capabilities. Her interior volume is expansive and rivals most European Builders and then some. Seller is motivated- pursuing other interests. This boat has all the amenities you would expect in a yacht this size and constantly upgraded. Truly turn key, in the water and ready to go for the remainder of the season. Priced to sell and all reasonable offers will be presented. Shown by appointment only. 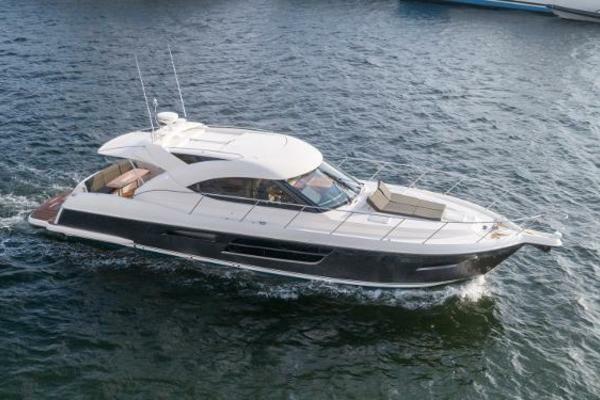 West Florida Yachts would love to guide you through a personal showing of this 46' Sea Ray 460 Sundancer 2004. This yacht for sale is located in Mystic, Connecticut and priced at $195,000. For a showing please contact us by filling out the form on this page and we will get back to you shortly! A centerline queen bed is forward with a ventilation hatch, hanging lockers port and starboard with a vanity to starboard. Aft to starboard is the electric settee followed by the recliner and end table. Aft to port is the master head with separate stall shower, vanity, mirror and Corian counter top. Followed by the spacious galley area with Corian counter top and molded in sink. Aft again to starboard is the day head with sink, vanity and mirror. The aft cabin with a U-shaped seating area that converts to a queen bed. Up to the helm deck with the helm to starboard and a single Captains seat along side a double bench seat. Helm deck air conditioning adds to the comfort and along the port side there is a wet bar. The spacious cockpit area has U-shaped seating that electrically comes together to form a large sun pad. Out the transom door to the extended swim platform with ladder and transom shower.